* Only available for Food Services. For your local assortment, please check your country website in the menu above. JOZO Himalaya salt originates from the Himalayas. It is rich in minerals and trace elements, which gives the salt a milder flavour. The shape and size of a salt grain determines the flavor impact. That is why JOZO salt is crystallized in various sizes [02-06]. 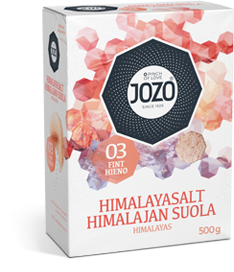 JOZO 03 fine salt consists of small grains that dissolve easily and connect the flavors of the individual ingredients. JOZO Himalaya salt is one of the oldest types of salt in the world, containing many minerals that are important to your body. The salt is sourced in the Himalayas and is naturally mild and tasteful. It gets its beautiful pink color from iron oxide and is typically millions of years old. Salt is better and more evenly absorbed by the ingredients if added during the cooking and preparation process. This is particularly true for ingredients that have been carefully assembled; you can't always just stir things up! Some foods also take a while for flavors to soak through. If you add salt only at the table, the liquid will benefit, but the ingredients will generally taste bland, like they were unsalted.